August is Tree Check Month, so be on the lookout for invasive forest pests in your parks, schools, urban forests, and where you live! August 2014 marks the 6th anniversary of the discovery of Asian Longhorned Beetle in Massachusetts. Since that fateful day in 2008, more than 30,000 hardwood trees have been removed because of this invasive pest. Emerald Ash Borer has most recently been found in the Arnold Arboretum, jeopardizing many Ash specimens there, and threatens millions of trees in Berkshire and Essex counties, everywhere in between in Massachusetts, as well as those in 22 other states. Join your fellow citizens during the month of August and check your trees for signs of damage caused by Asian Longhorned Beetle and Emerald Ash Borer, and learn to recognize the beetles themselves. 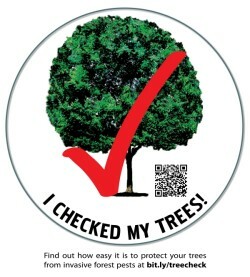 For more detailed information, visit http://bit.ly/TreeCheck2014 or contact Stacy Kilb, ALB Outreach Coordinator at [email protected] or (617) 626-1764.